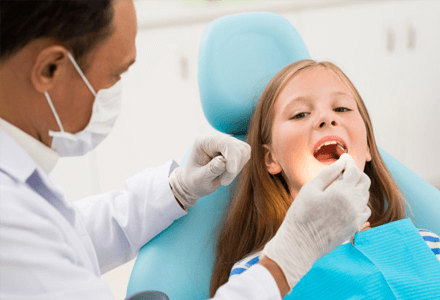 With Children we place an emphasis on good oral health in general and prevention in particular with the most advanced diagnostic, sterilization and treatment technology available. Personalized service with uncompromising excellence coupled with our warm and compassionate approach keeps patients returning and recommendations flowing. Regular check-ups at monthly intervals allow us to suggest preventive measures to ward off dental disease, and also offer minimally invasive painless solutions for any minor dental concerns we may detect. We teach children how to care for their teeth well which establishes good lifelong oral hygiene habits. Shah’s Dental Serenity provides several treatments for children to avoid any future dental problems. One of them is application of a sealant, a clear or shaded plastic material, on the chewing surfaces of back teeth (premolars and molars), where four out of five cavities in children are found. Basically, this acts as a barrier to food, plaque and acid, thus protecting the decay-prone areas of the teeth. This process is usually quick, non- invasive and takes only a few minutes. The tooth is thoroughly cleaned, prepared with a special solution and dried. The liquid sealant is then applied and allowed to set hard by shining a blue light onto it. Sealants are a recommended and time tested deterrent for cavities in young children. At Shah’s Dental Serenity we strongly advocate preventive methods for children’s oral care. That is why our dentistry experts suggest routine exams for children in order to keep their teeth cavity free and healthy. Shah’s Dental Serenity is where you can find effective expertise for your child’s dental health. We provide a broad range of treatments that help a child have healthier teeth and gums. Using shaded or clear plastic materials, we provide cavity protection for your child’s molars and premolar teeth. These materials don’t allow plaque, acid or food particles to enter and create cavities in teeth. Our extensive technology allows us to complete this process within seconds. There are a variety of treatment approaches that we incorporate to provide child dental care. 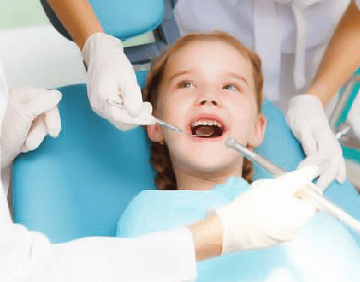 Trusted Child Dentistry Specialists In Mumbai. Acids can cause rapid tooth decay in children. However, this issue is also treatable with mineralization. Our experts follow a simple but thorough procedure to treat children’s tooth. Mineralization offers the much-needed strength and doesn’t allow bacteria to cause decay. This preventive measure has allowed hundreds of children to have healthy baby teeth with no pain at all. Contact our child dentistry expert! If you are concerned about your child’s oral health, feel free to contact us at Shah’s Dental Serenity. We can answer your questions and recommend suitable treatments to ensure a healthy teeth growth of your child.